Rinpoche is currently leading the Ganden Lha Gyema retreat at Istituto Lama Tzong Khapa in Italy, which ends on Sept 30th. Rinpoche will teach at the Kopan November course, and will then visit Bangalore on December 6th for the teaching currently scheduled to be given by His Holiness the Dalai Lama at the request of Choe Khor Sum Ling Study Group (the group which His Holiness asked Rinpoche to start). In 2005, the main long retreat students can join Rinpoche at may be the three week retreat on the Long Dharani of Chenrezig at Shakyamuni Center, Taichung, Taiwan in February. 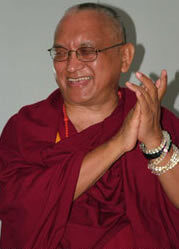 Rinpoche will then lead short retreats and giving teachings in Malaysia and Singapore in March. Rinpoche expressed how happy he was with the recent CPMT meeting (which was hosted really well by Maitreya Institut, Emst, Holland). There were 102 participants representing 53 centers and 7 regional/national offices. Rinpoche attended many of the sessions, and gave lots of extremely helpful advice, which will all be available as part of the CPMT Minutes. Rinpoche made a special point of thanking all the people who made the effort to come to the meeting, and hoped that all those present would come to the next CPMT meeting, together with many more people offering service in FPMT. Rinpoche mentioned how FPMT has only just begun – which was interesting given that this meeting felt like a landmark for FPMT, with over 102 participants! During this time in Holland, Rinpoche talked about the Medicine Buddha practice. (Notes taken and edited by Kendall Magnussen). One of the benefits of Medicine Buddha practice is that it helps to bring success. Why was Buddhism so strongly established in Tibet? This was due to Medicine Buddha practice (the long version by the Fifth Dalai Lama). It brought so much success and so he was able to preserve and spread the Dharma. All of the lineage lamas did this. When they passed away, there were incredibly inspiring stories. (Rinpoche just read about this in a text from Mongolia). Medicine Buddha practice helps to bring prosperity, both in spiritual practice and materially. The benefits are contained in the Medicine Buddha Sutra. There are mind-blowing benefits! Therefore, Rinpoche is advising all the centers that it would be extremely good to do the Medicine Buddha Puja. See if you can do Medicine Buddha puja on the Tibetan 8th of the month. If you can do Medicine Buddha puja on the morning of the Tibetan 8th, then you can do Chittamani Tara (Four Mandala Offerings) in the evening, as this is a highest yoga tantra practice. Alternatively, on the Tibetan 15th one can do the Medicine Buddha puja and on the 8th one can do Tara. This helps in spiritual development and to receive all the needs to benefit for other sentient beings, all the conditions, the material needs, for success in all the projects. Medicine Buddha is powerful purification. It is one of the best things to do for someone who has passed away. It is not only for sickness, it is for anything. ‘Thank you very much your kind letter regarding Sangha marrying people. How this started is that our Guru Lama Yeshe, who completed the study of all the 5 great scriptures, the 5 main subjects studied in Ganden, Drepung and Sera, who is a learned scholar, who completed all the subjects including Vinaya (all the pratimoksha vows), and who in reality inside is a yogi, who has not only the 3 Principal Aspects of the Path to Enlightenment, but also generation and the completion stage, clear light and the illusory body, highest tantric realizations, there are many facts and signs of Lama having these realizations, but who at the same time can act to the children like a child and for old people in that way, who fits all the different kinds of people. In Lama’s skilful means and compassion he arranged pujas like Tara puja and so forth for the couple for their well-being (when they would request a marriage blessing). Then Ven. Pende who started the Karuna Hospice in Brisbane, Australia, which is extremely successful, that people have very high value and regard and feel very fortunate to be taken care of by Karuna Hospice when they are dying. Somehow naturally he also started to do the marriage ceremonies for people, then also somehow naturally the nun, Ven. Namdag also started. So many Buddhist people requested for her to do the marriage ceremony, also you have to have a marriage license, which Pende and Namdag have. My idea now is for the Sangha to perform Tara pujas, recite prayers (such as zangcho monlam, prayers of the Bodhisattva life stories and previous lives of the Buddha having practiced charity, morality and patience), make extensive offerings and dedicate the merits for the couples well being, and also for the other people who are attending the ceremony, who may not have heard dharma, and who are not Buddhist, so this may be one time opportunity for them to hear the Dharma, so in this way they make connection to Buddhism and hear explanation about the purpose to practice loving kindness, good heart to each other and for the new couples life together to be of benefit to others. I didn’t have the intention for Sangha to do marriage ceremonies, it just happened naturally and now after you brought up this issue, it has made me think. I think that our lay elder students now can perform the marriage ceremony (with the license) and then if the couple come to the center with all their relatives then the Sangha can perform pujas and prayers for their well being. Also this is not the first time the couple have met, it is not the first time of bringing the couple together. So it is not like the Sangha person is putting these two people together to have a relationship, they already made the decision to be together, already have a connection and relationship. So this is the information I want to inform you. I don’t think it needs Sangha to perform marriage ceremonies, even though Buddhist people from their side do want them to, I think it is not necessary, instead I think Buddhist lay elder students can do it. In August Rinpoche wrote a long (16 page) letter to a prisoner, a new Buddhist, who had just been given his date for execution in 3 months’ time. This advice from Rinpoche was given over 5 days, and is a fabulous resource for us all: for new students, as Rinpoche clearly explains many of the key concepts of Buddhism, such as reincarnation, the mind, the benefit of living in morality; for Rinpoche’s students, as Rinpoche includes many personal recollections; and for students working with prisoners, as Rinpoche talks in depth about the benefits of being in prison. The talk is available to download or read in full at https://fpmt.org/teachers/zopa/advice/ (Advice for New Students and Prisoners). Even if someone has only one day left to live, even only one hour left, they still have an incredible opportunity to make the human body – which they have received just this one time – most beneficial. Even if they have only one hour left, still, in that time, they can take the five lay vows or eight lay precepts. …On the day that you will be killed, the last thing before you actually get killed you should take complete refuge in Chenrezig, think of Chenrezig, visualize the same as the picture I have sent you, and totally rely on Chenrezig. Think: “May I experience all the suffering on myself of all beings who have the karma to be executed and those who actually do the killing, and may I let everyone else be free from this suffering.” Put your palms together in the mudra of prostration to Chenrezig and request to be guided by Chenrezig in all future lifetimes from now and in all lifetimes until enlightenment. Think: “May I receive all sentient beings’ karma to be executed, may I experience this by myself alone, and because of that may all others be free from all the sufferings and receive all the peerless happiness up to enlightenment.” Continuously think this way, over and over again. If you die with this thought of giving up yourself to experience all other beings’ suffering of being executed and giving all the happiness to others, it is unbelievable. This becomes your main refuge. In particular feel this for those who have the job to execute you, as well as the people who have given this order, the judge, etc. Because by their creating this negative karma, then having acted on it – which comes from impure mind, attachment, anger, ignorance, particularly self-cherishing thought – they will have to experience the karma of being killed by others, executed for 500 lifetimes, just from this one action of killing, which is the cause. By using this punishment of being executed, being killed by someone else, as a means for yourself to achieve enlightenment for sentient beings, this experience of being executed becomes the cause of happiness for all sentient beings, not just temporal happiness but liberation from samsara. and ultimate happiness, full enlightenment. Therefore there is no greater enjoyment than this. This experience of being executed is a most exciting opportunity to bring ultimate joy and happiness for oneself and all others sentient beings. Happiness and problems all depend on how your mind interprets it, whichever label you put on it, whether it is happiness or problem, and then believing it: then it actually becomes suffering or happiness. Training in this way of thinking – actually being able to transform being killed by somebody by seeing it as beneficial and a cause of happiness for all sentient beings – becomes the best Olympic sport. All these Olympic champions are nothing compared to someone who trains in this meditation practice. This means that what is suffering for most ordinary people can be transformed into great skies of happiness for oneself and for others. By doing this you become the best Olympic champion, the best mental champion. This is such an incredible psychology, an incredible way of thinking. So now you can have incredible joy at being in prison, you can see how you can make life so meaningful. If you do these practices, all the Buddhas and bodhisattvas will be with you, will be around you, supporting you; all the holy beings will be with you when you die. Maitreya Amsterdam director and FPMT Board Member Paula de Wys-Koolkin with her broken foot at CPMT. ‘I would like to thank every one of you, all the staff and members of Maitreya Instituut, from the bottom of my heart for all your dedication and service in helping sentient beings, whose continuation of samsaric suffering has no beginning. Even though the continuation of their suffering has no beginning, with our help it can be ended. Since everybody has Buddha-nature, it gives the possibility to end suffering. Thank you very much for dedicating your lives to offering service to other sentient beings, creating the conditions for them to meet and practice Dharma. One point is that the suffering of sentient beings didn’t begin with this life, with their present rebirth; the continuation of their suffering has no beginning. Another point is, as I often mention during the motivation for teachings, all our own numberless past, present, and future happiness, realizations, and enlightenment – everything – is received by the kindness of every single sentient being. Every collection of goodness, past, present, and future, up to enlightenment, is received by the kindness of every single sentient being. There’s not a single one from whom we don’t receive our happiness. We receive our happiness from every sentient being: from every insect, every human being, every hell being, every hungry ghost, every sura, every asura. Every one of them is the same in being the most precious, the most kind one in our life, and we need to repay their kindness. I want to thank all of you on behalf of all the sentient beings. I want to thank you on behalf of the numberless hell beings, the numberless hungry ghosts, and the numberless animals. They can’t thank you because they can’t speak. By having taken a human body this time, I can use it to say thank you on behalf of all of them. I would like to thank you on behalf of all the human beings as well, who receive so much help from the effort and dedication of the whole community at the Center. The third point is that you are continuing the holy wishes of Lama Yeshe, the founder of the FPMT organization, in benefiting not just this world but all sentient beings. Take the example of one person who comes here to the Center and learns about the importance of living their life with compassion for all living beings. Each time the person begins a sadhana, does prostrations or makes offerings, they generate a motivation of bodhicitta, the thought to benefit all sentient beings by freeing them from all suffering and bringing them to full enlightenment; they do the practice for that reason. Or when serving others in their daily life, they generate bodhicitta at the beginning. Each time they generate a motivation of bodhicitta, it benefits all sentient beings. Numberless sentient beings receive all their happiness, temporary and ultimate (liberation from samsara and enlightenment) from that person. You can see the result of someone coming to the Center and learning about the need of compassion for sentient beings. All sentient beings need happiness, and that has to come from compassion, so the person generates compassion. The person also needs compassion, the root of bodhicitta, for his or her own enlightenment, to complete the realizations, the works for self. You can see that each time the person generates a motivation of bodhicitta at the beginning of each practice or service they collect limitless skies of merit and that leads them to enlightenment. Other sentient beings also receive more and more happiness and peace from that person; eventually the numberless sentient beings who have a connection to that person receive all the realizations and enlightenment. All these benefits come from the Center. This is what the Center offers to each person. This comes from the director, who takes the mountains of responsibilities on their shoulders, on their head, and also on their nose, and from all the staff at the Center, who share in taking responsibility for the different jobs at the Center, including the efforts to arrange and take care of the teacher and translator. Even though only a small group of people might come to learn Dharma, each person eventually has an effect on numberless sentient beings. Each one benefits by bringing all happiness, including enlightenment, to all sentient beings. That’s how we should see the long-run benefit of the Center: we are offering skies of benefit to sentient beings. We learn Dharma and meditate so that we can stop harm to others and benefit them; this reason is as extensive as the limitless sky, because there are numberless sentient beings, who want happiness and don’t want suffering. During the twenty-five years since Maitreya Instituut started, so many people have come to hear teachings. If you analyze like this, you can see that there has been immense benefit from the Center to each person, now and in the future, up to enlightenment. It’s something that happened so easily, but even if one had to work extremely hard for one eon to offer this benefit to sentient beings, it is so worthwhile. Even if you had to work extremely hard and bear hardships for three countless great eons in order to bring about this benefit, it would be so worthwhile. In Maitreya Buddha’s teaching “Do Degyen”, it is mentioned that bodhisattvas don’t feel depressed even if they have to bear hardships for eons in order to cause one virtuous thought to arise in the heart of one sentient being. They are happy, not depressed, even if they have to bear hardships for that much time. So here what we are offering has come in a very easy way. There is an utmost need for Dharma Centers, because they offer all these benefits mentioned above. All these benefits come from every one of you, from all the members of staff, from the Dharma teacher and translator, from the benefactors who give funds and material help and their time and from those who come to learn. The benefits come from those who did all this in the past, are doing it now, and will do it in future for Maitreya Instituut.